They are among us... A long time ago, first reports about the new Intel chip set including new CPUs and video cards appeared in our news. Now time has come. We may report about: "Santa Rosa" built-in in the Samsung R70 with Intel Core 2 Duo T7100 CPU and NVIDIA Geforce 8600M GS video card. You can read here what can be expected from the new multimedia class. As already well-known, Samsung focuses on design and layout. Of course also many of us know, that this does neither guarantee a good look nor please everybody's eyes. 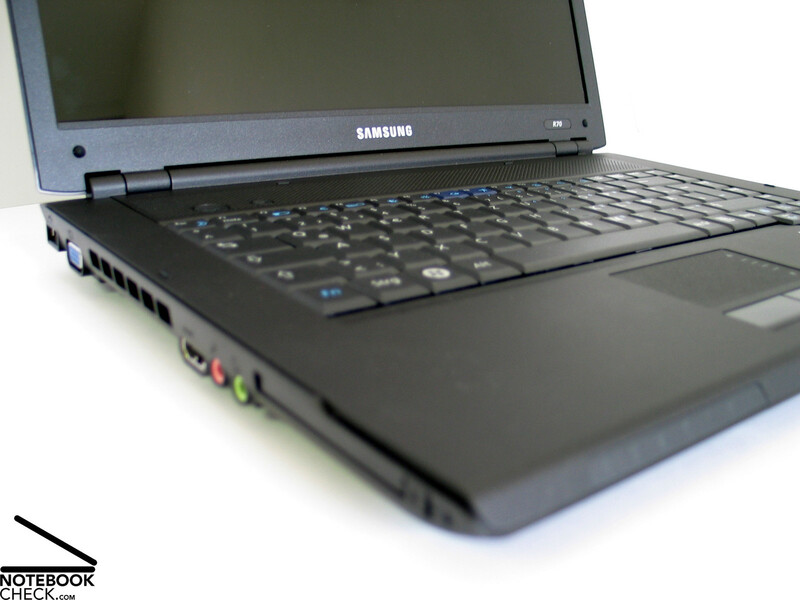 At least regarding the R70's design, it seems that Samsung made good decisions. The case is totally black, missing out any color highlights. 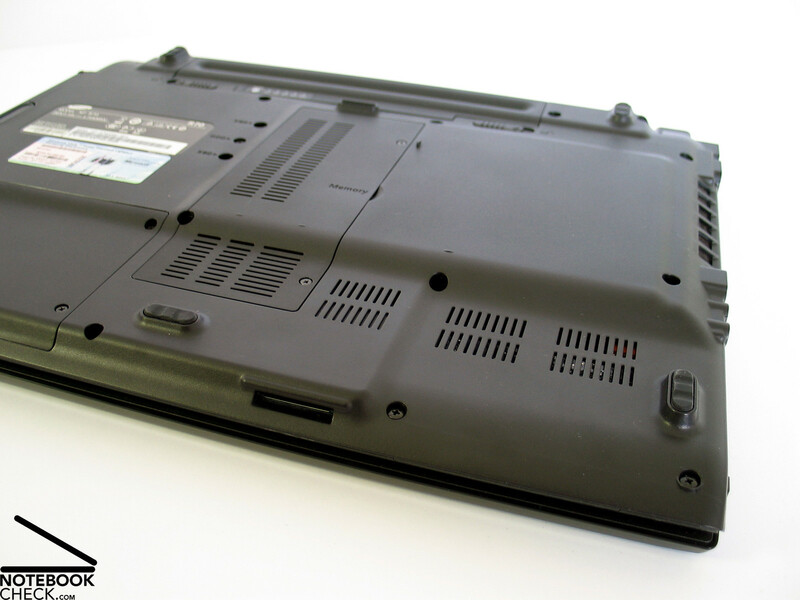 However, needless to be afraid of a - lets call it like that - "Thinkpad dullness"
A pleasing line arrangement which is applied to the R70's case ensures this. Simple right-angled inter-component gaps, but still cone-shaped edges and beveled corners do not only look good, they have also a positive impact on handling this notebook. Generally, this notebook's haptics feel very comfortable. The base unit and their surface feel soft and velvety. This stems from a roughened surface. The display cover was coated with a black mirror finish, which further improves the look of this notebook. Only daily use can prove how resistant this surface is against possible scratches and other evidences of use. To be on the safe side we recommend using a soft notebook bag, in order to appropriately protect this good looking surface. 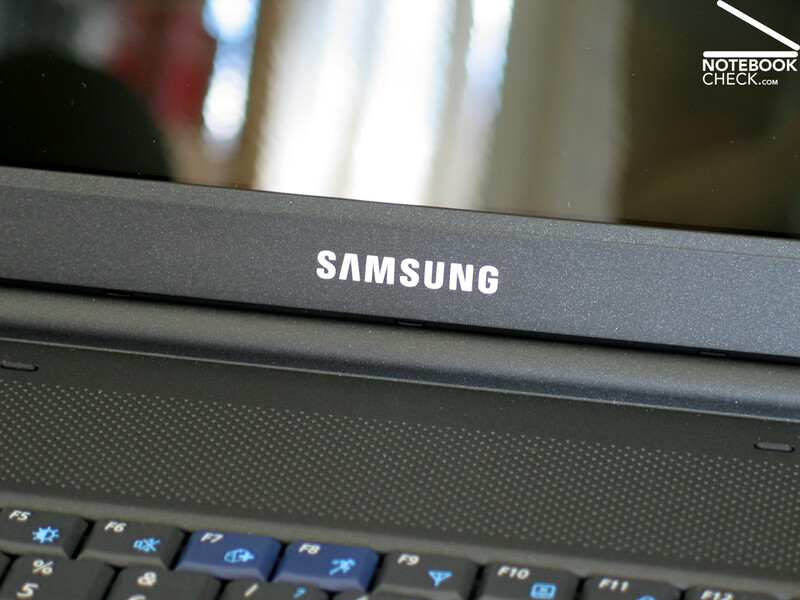 The Samsung R70's workmanship convinces too. We could neither detect noticeable gaps nor wobbling parts. The used materials also give a high-quality impression. Regarding robustness and stability of the case, the R70 scores unsurprisingly also rather good. The case is sufficiently resistant against applied forces and also against torsions. 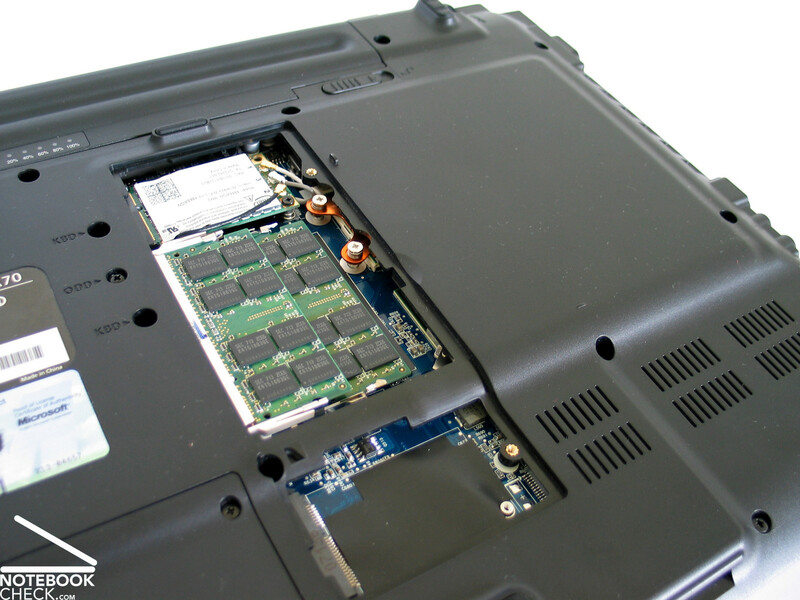 The only weak point is next to the optical drive at the bottom side of the notebook. Here the surface of the case yields slightly under pressure. hinges are beautifully placed in a kind of molding, however, adapting the display position leads to a slight see-saw. Furthermore, we have to mention that a transport hook is missing. On close, the display is automatically completely drawn closed by a mechanism and securely kept closed with sufficient tension force. In order to protect this notebook from object penetration, we recommend to carry it in a separate cover. The ports of this notebook are mainly at its right edge as well as near the right corner on the back side. So, cable spaghetti are avoided by an order which is proper for both left and right handed users. 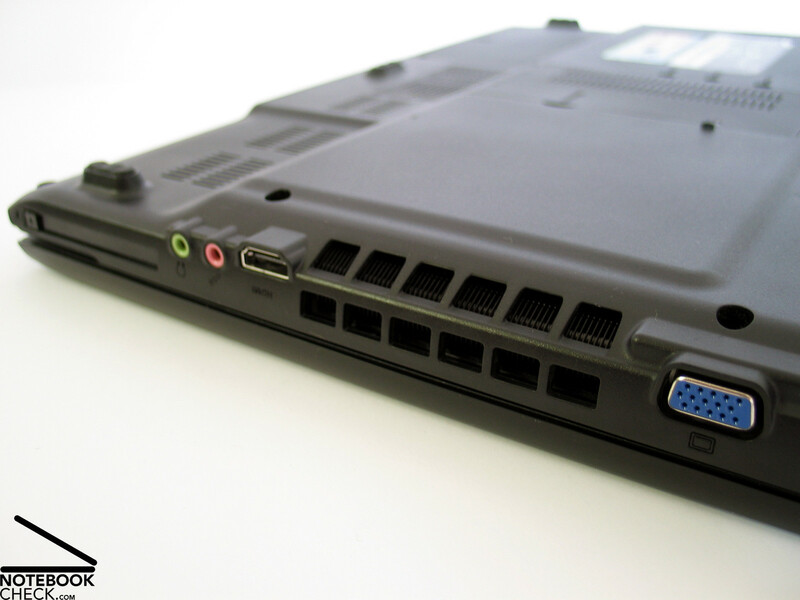 The HDMI port provided at the right side is note-worthy. 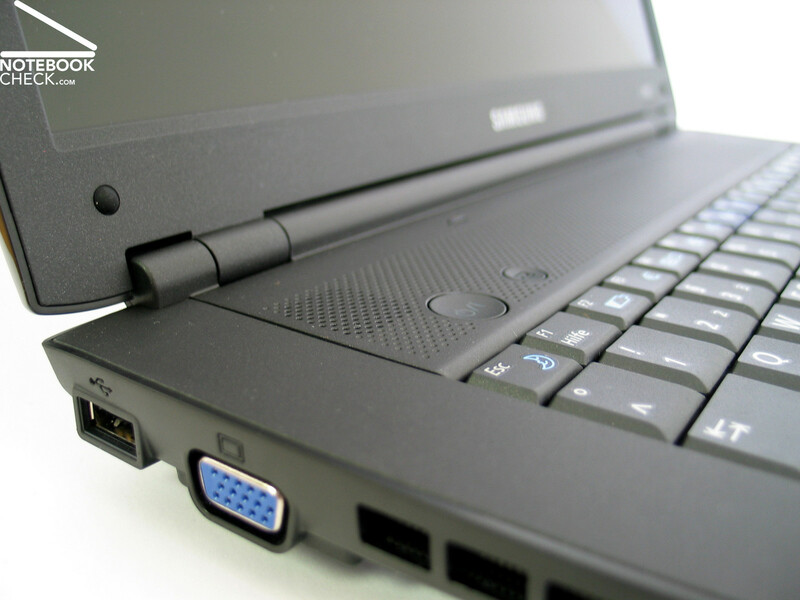 It and both audio ports are relatively near to the front of the right edge. The first impression is received by the look of the keys. They are colored identically black than the surrounding parts and also please by their otherwise decent appearance. Besides this, the keyboard also works first-class. The keys have a comfortable point of pressure and resistance and a well dimensioned travel. Typing with these geometric, but not unergonomic keys feels very comfortable. 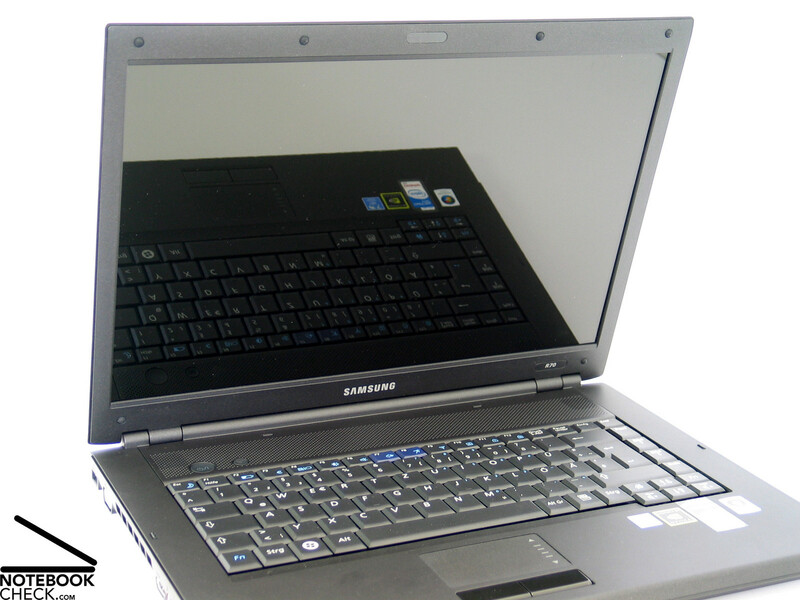 All of the keys can be hit without any problems and also the noise level emitted during fast typing is alright. 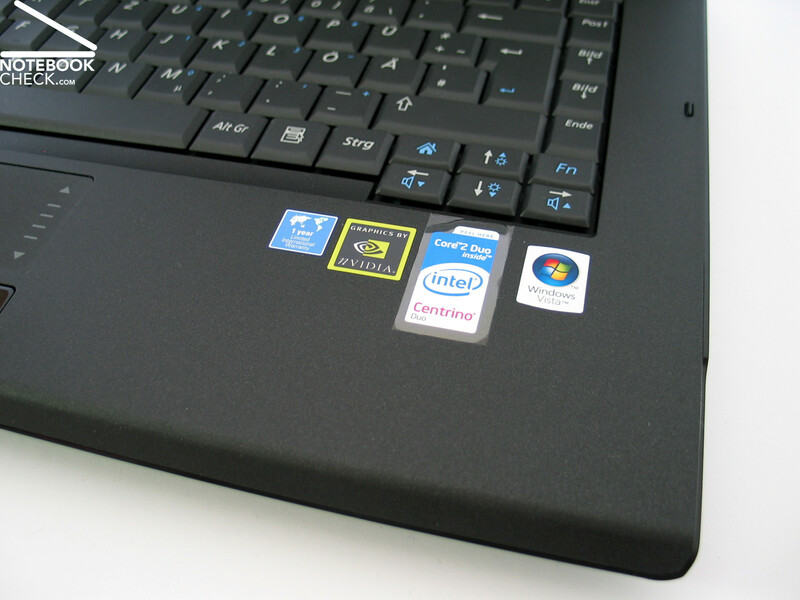 We liked the touch pad mainly because of its surface, which is comfortable in use. Its sliding properties are very good, because of a somewhat roughed up surface. Regarding precision and response the pad is without any anomalies. 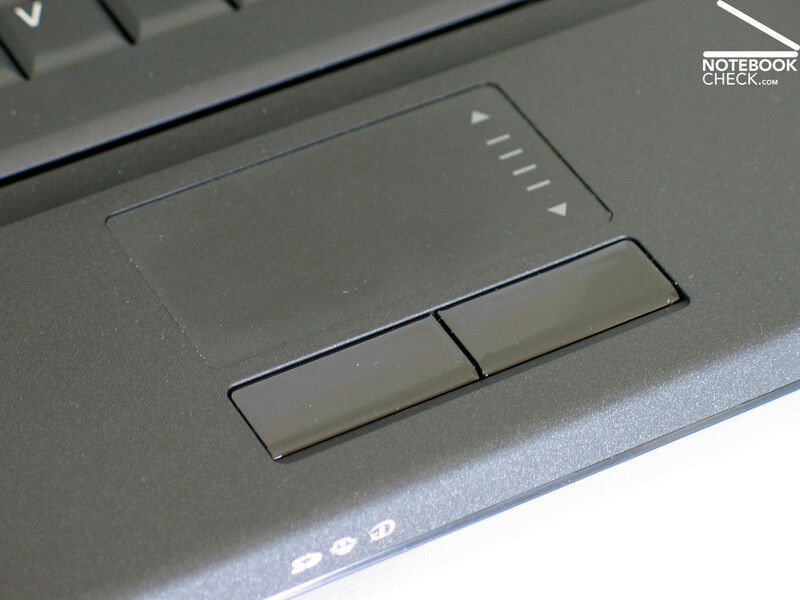 Both buttons stand out against their surrounding by their coating, but they can still be used without any problems. For the benefit of a decent design, hot keys were completely missed out. All functions are supported by assigning additional functions to some of the keys, which can be invoked in combination with the FN key. 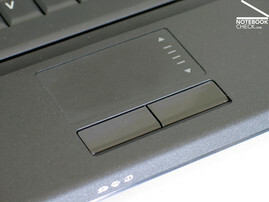 The power switch is shapely integrated at the left upper corner of the keyboard. Beside it, there is also a very decent button for the AVStation Software, which supports the playback of videos and music without the need of starting the operating system. 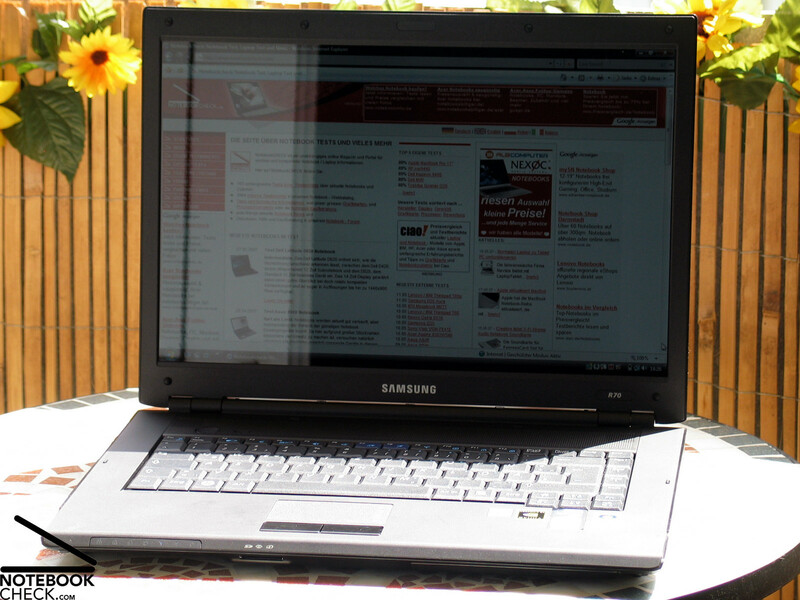 The Samsung R70 is equipped with a reflecting (Glare Type) 15.4 inch wide screen display with a maximum resolution of 1280x800 pixels and, so, follows the current trend. However, it's noticeable that for Vista with its graphical gimmicks and oversized window frames a higher resolution would be preferable. The measured maximum brightness was 164.4cd/m² at the center of the display. A good value. As the brightness only slightly diminishes at the upper edge, the illumination is still acceptable at 80.4%. The average brightness of 143.3 cd/m² is also throughout acceptable. The color diagram depicts optimal red and green color curves and, as usual, a lowered blue color curve, which lets the colors appear warmer. The black value of 0.7 cd/m² and the maximum brightness of 164.4cd/m² lead to a good calculated contrast ration of 235:1. Regarding its speed of reaction, the display scored average without any anomalies. Even outdoors, it is still possible to rather well identify the contents of this display. This presumably stems from its good average brightness. However, in very bright environments you'll face the usual reflections, which make working difficult. The stability to the vantage point of this display can horizontally be characterized by a good area of operation, and a diminishing contrast and reflections at very acute angles. Vertically, the panel's area of operation is just sufficient. Outside it, you'll quickly face the usual darkening or whitening. 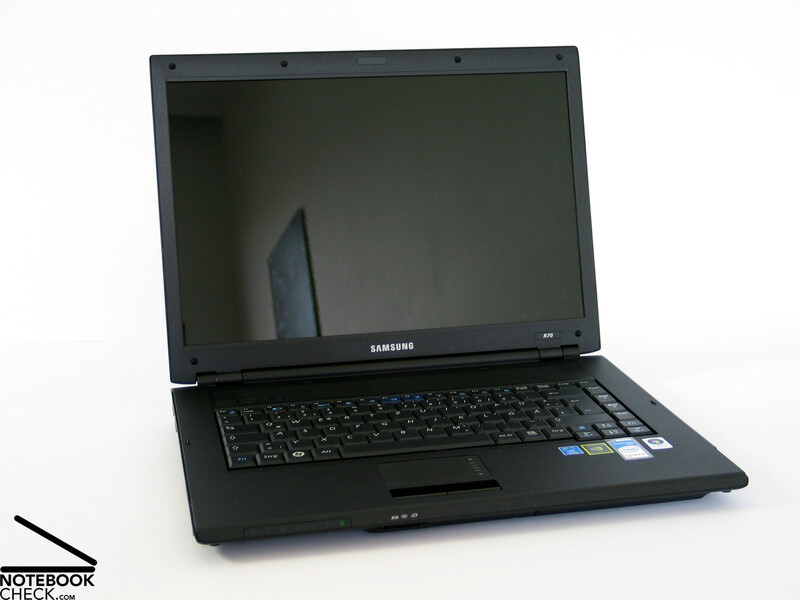 The Samsung R70 presumably demonstrates the future standard multimedia configuration. So to say, the currently most common combination of Core 2 Duo and Geforce Go 7600 video card or X1600/X1700 video card, is likely to be replaced by Intel's new processors and NVIDIA's Geforce 8X00M video card generation. Particularly, this new processor generation features a 800 MHz front side bus and the so called "Dynamic Acceleration Technology", short DAT. The benefit for the users will be an up to 20% faster computer. The new Geforce 8600M GS video card is the successor of the well-known and approved Geforce Go 7600. In the future the "Go" will disappear from the model name and be replaced by "M" (maybe short for mobility ?!). Technical innovations are DirectX 10 support and a new vertex and pixel pipeline technology. So called "steam" processors are responsible for the tasks formerly performed by the pixel and vertex shader ("unified shader"). And where is the benefit for the user? Of course - what a surprise - another plus regarding speed and performance. 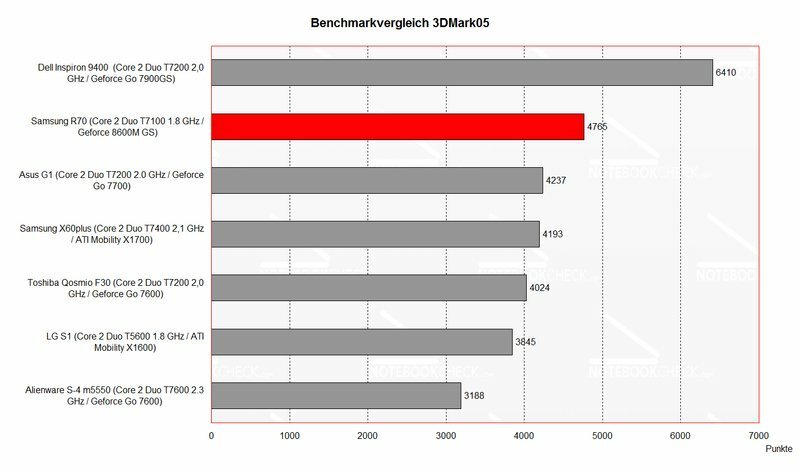 In total, the performance of the new Geforce 8600M GS video card scores slightly better than a Geforce Go 7600 or 7700. Our benchmark results conform with this. Whoever counted on considerable performance gains, will be disappointed. 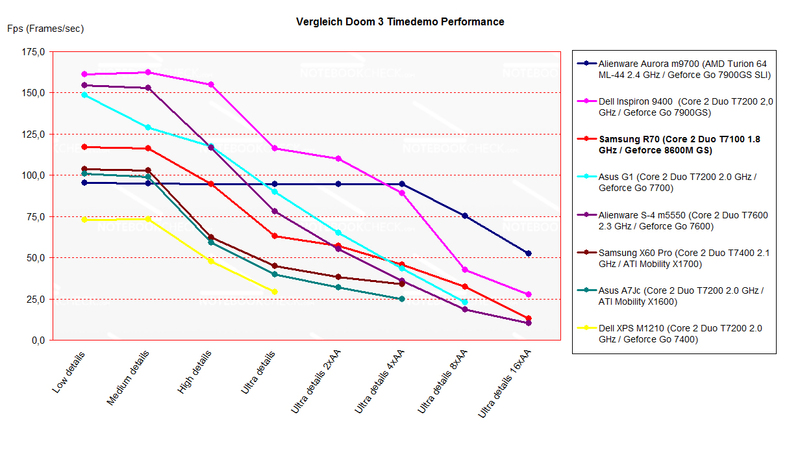 The Doom 3 as well as the FEAR performance test uncover that the 8600M GS scores the same or even slightly below a Geforce 7600/7700 and is only able to outperform them at maximum performance demands. The practice test with current games like Call of Duty and Supreme Commander uncovers that the performance level of this notebook is similar to hitherto existing multimedia notebooks. It's exiting to look at games with DirectX 10 support. That remains to be seen, because at the time of writing no games with DX10 support are available. 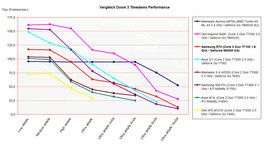 In total NVIDIA meets the expectations regarding technology development, although big positive surprises fail to appear. 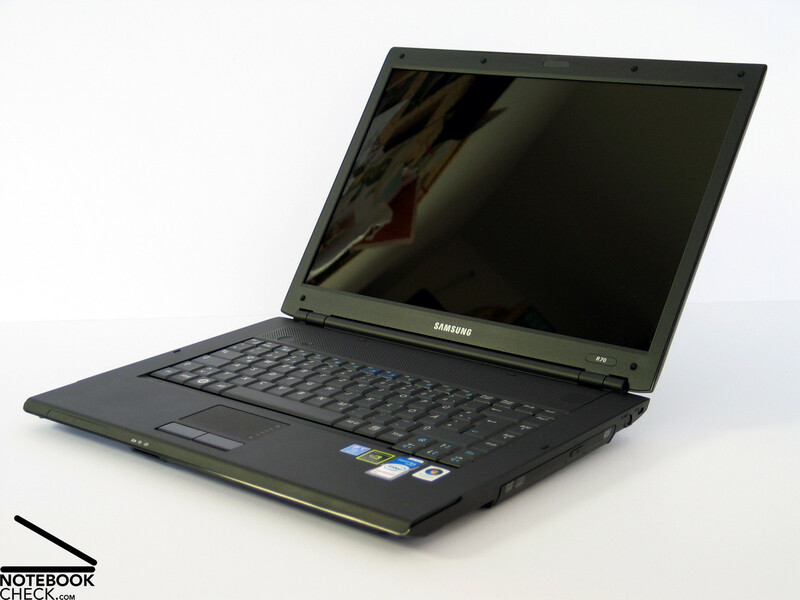 The 8600M GS is likely a video card to be used in middle-class notebooks. 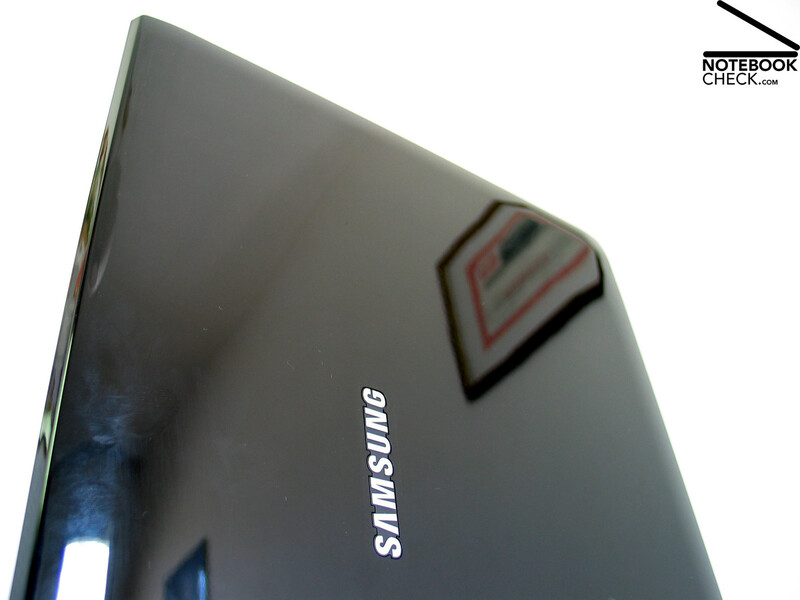 Last but not least the 160GB hard disk built-in the Samsung R70 has to be mentioned. It is average regarding transfer rates and access times. However, the memory capacity should be alright. Further information about the video card can be soon found here or in our comparison of mobile video cards. Detailed information about the Core 2 Duo CPU can be found here. This notebook scored especially good regarding noise emissions. During idle mode the Samsung R70's emitted noise is very decent and even in very quiet environments very scarcely audible, although the fan runs all the time. This property is supported by a big vent hole at the left side, which helps emitting the waste heat without much creation of swirl and, so, also only with low noise emissions. Under load the notebook can be clearly heard, but is is still far away from being loud. Generally, the noise of the fan can be characterized as low-frequency noise. 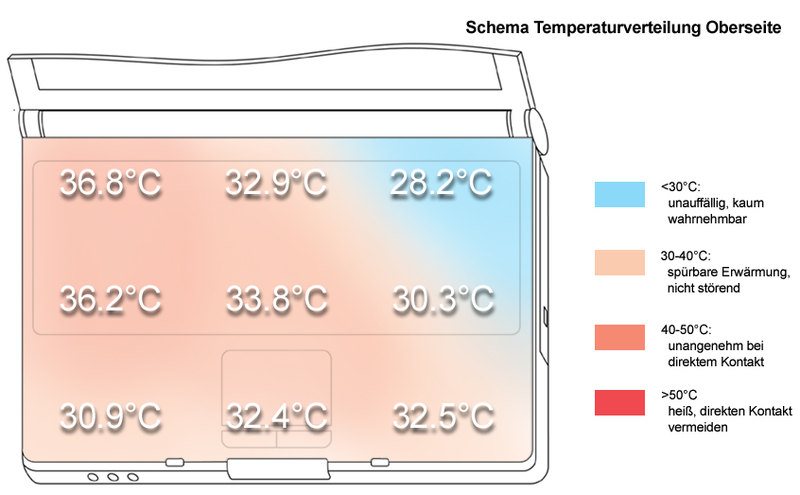 Not only the noise emissions also the surface temperature of this notebook cannot be objected to. 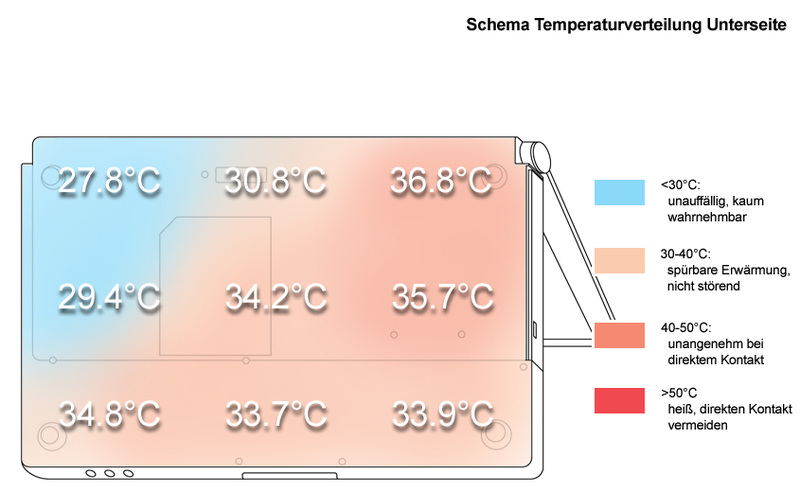 With a maximum of 36.8°C at the left side of the keyboard (fan) the top side heats nearly equally than the bottom side. The speakers are left and right above the keyboard and they sound absolutely alright. The maximum volume is alright, too, and they sound is still 100% clear at maximum volume. However, the basses are as usually dull. 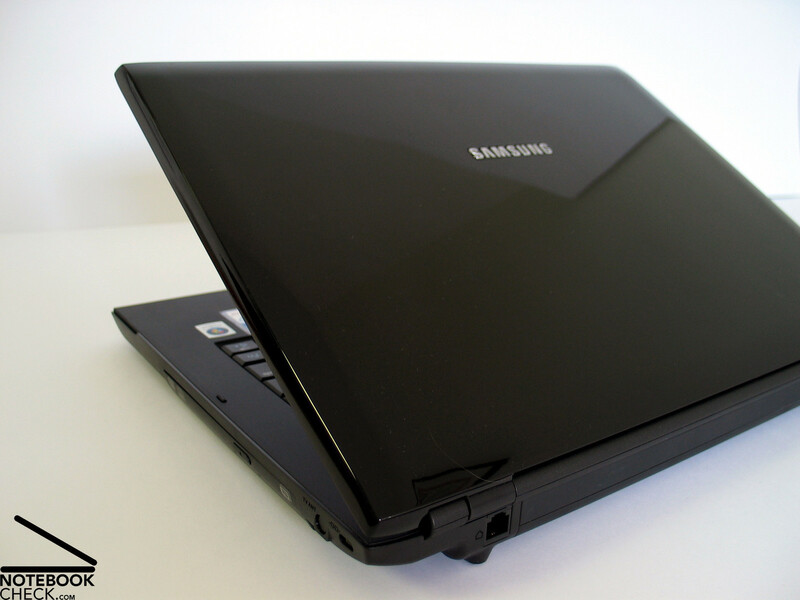 The Samsung R70 is equipped with a 5200 mAh battery, which provides sufficient power for unplugged work between a minimum of somewhat about an hour and a maximum of roughly four hours. Especially, the runtime for wireless Internet access with about 3 hour is alright and allows a workable mobile use. 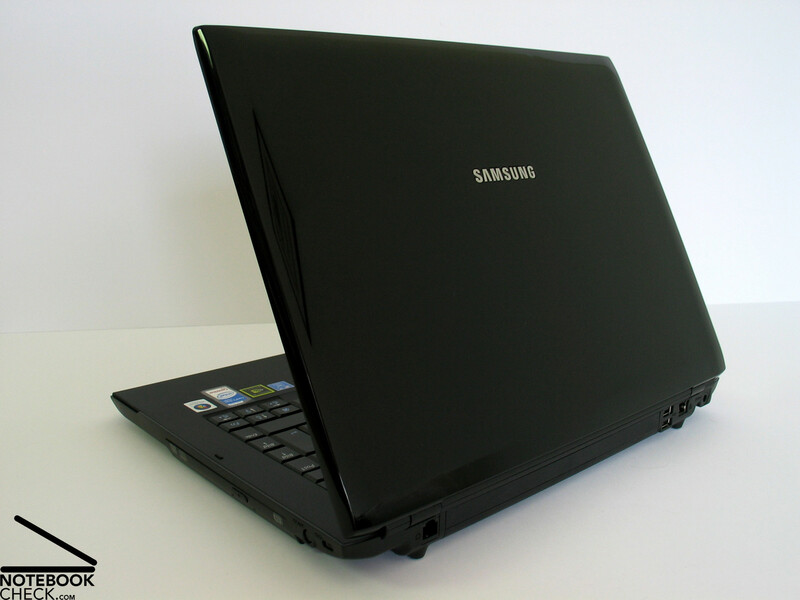 Initially, the Samsung R70 attracted our attention primarily because of the brand-new hardware technology. But, soon it convinced us completely. Besides a felicitous layout, we also found that the choice of materials and the workmanship are sound, and that the input devices are user-friendly. 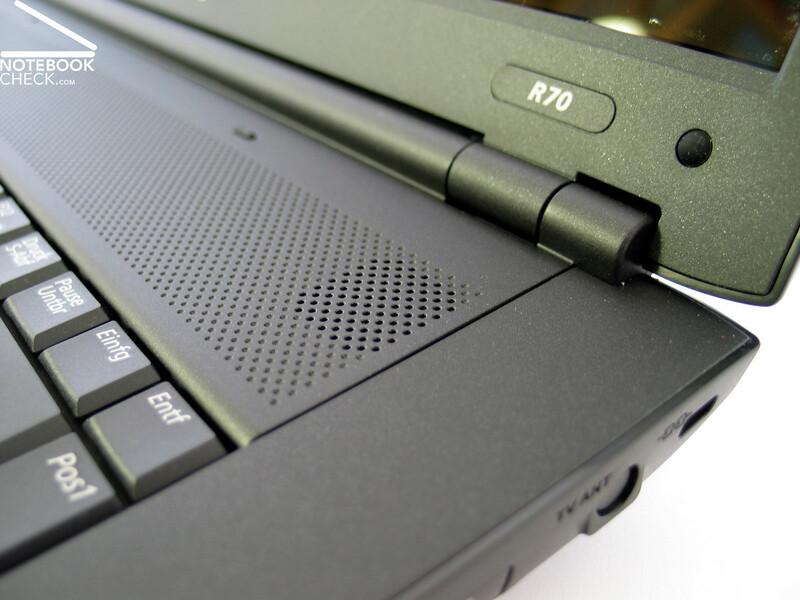 The R70 does not only look good, also its haptics are enjoyable. 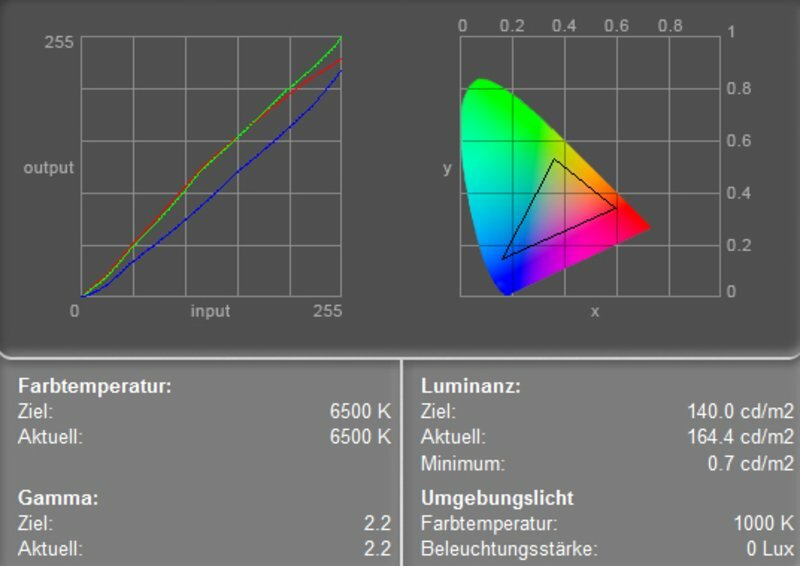 The R70's display has a good maximum brightness and a good illumination and a well acceptable average brightness of 143.3cd/m². If any, the stability to the vantage point can be considered a weakness. The reflections can also make working cumbersome. As already mentioned, we were basically interested in the new technology, codename "Santa Rosa". 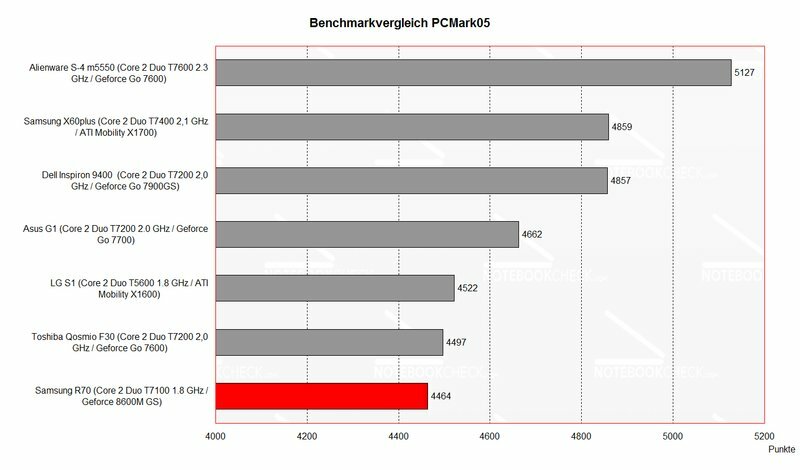 The new Intel T7100 CPU and the brand new NVIDIA Geforce 8600M GS video chip provided good performance, although in total they did not meet our hope for a big performance increase. Another plus of the R70 are its low emissions. The noise as well as the temperature emissions are alright and are hardly annoying. Least, also the battery runtime is passable. 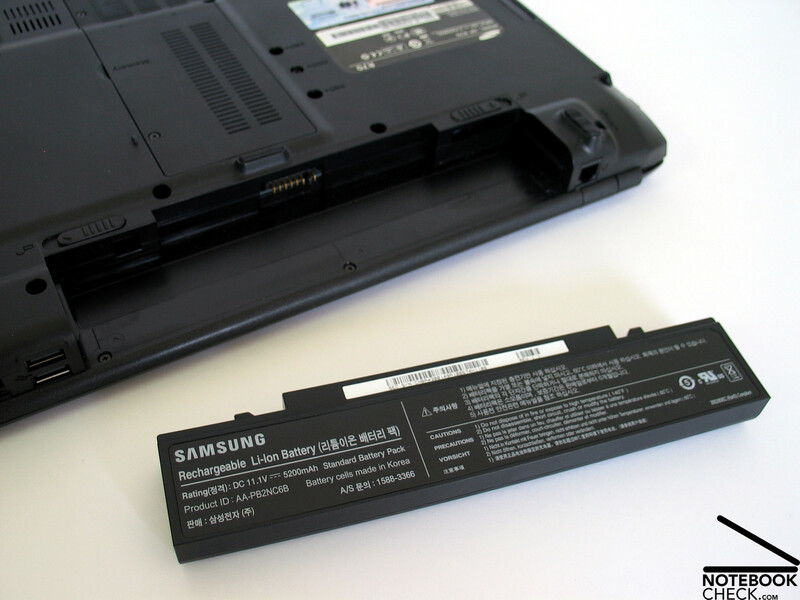 A battery runtime between one and four hours makes the Samsung R70 also fit for mobile use. The sound of the speakers is also alright, but, the basses are weak. Also the R70's temperature emissions are without anomalies. A plus: the noise emissions are very low. 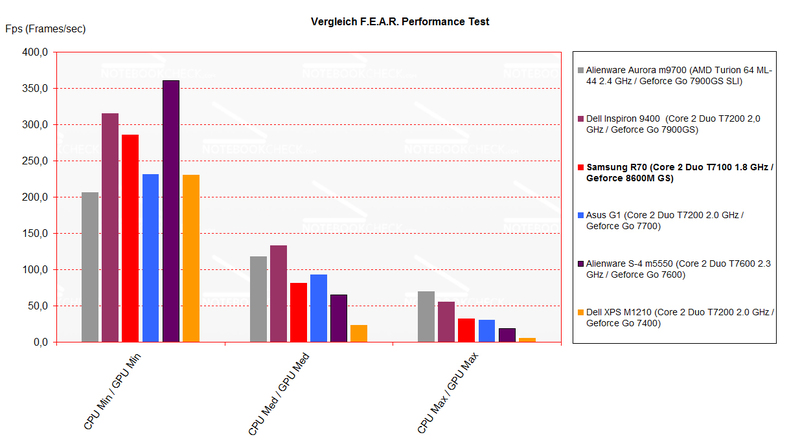 The Samsung R70 scored good at the benchmark tests, however, the performance at current games is only average. The highlight of the Samsung R70: Santa Rosa chip set with Intel T7100 CPU and Geforce 8600M video card. The measurement values of the display were alright, however, it clearly reflects and has slight weaknesses regarding stability to the vantage point. 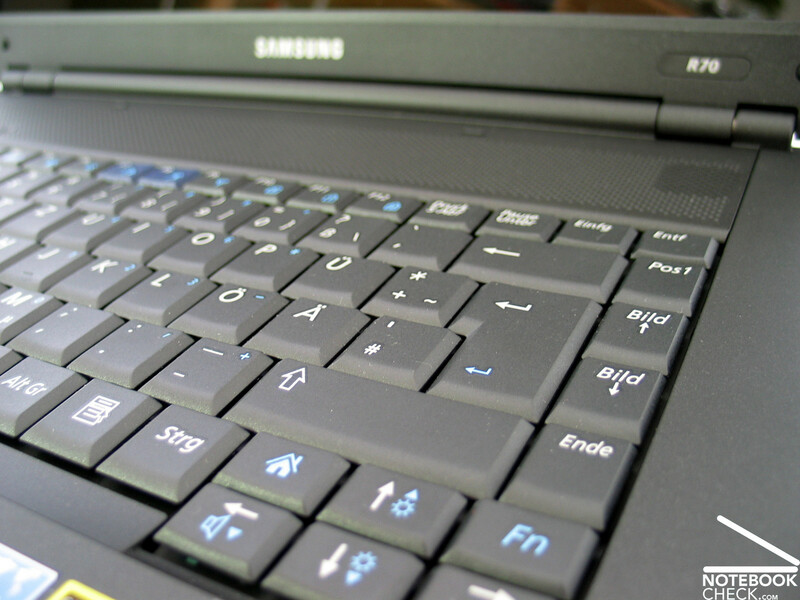 We also liked the R70 keyboard, which scores by comfortable typing. 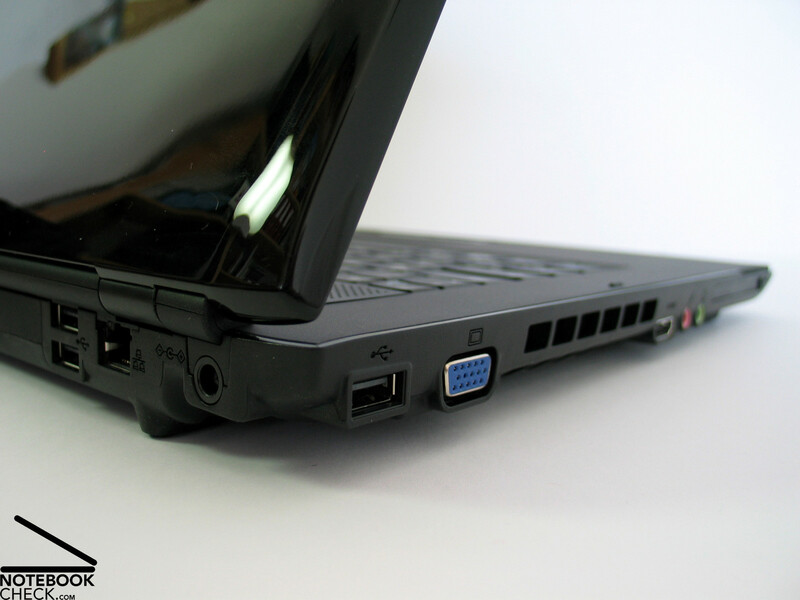 Besides the standard ports, it is also equipped with a HDMI port. 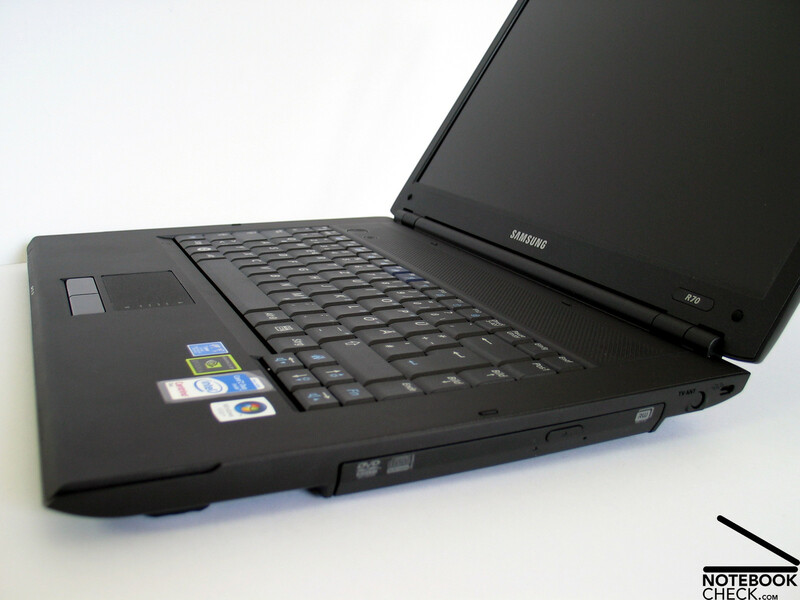 Time will show, how durable the elegant coating actually is, if the notebook is intensively used. ...and a decent design with clear forms. 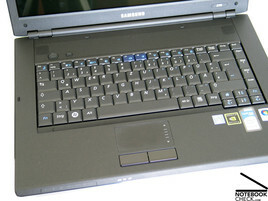 ...gives the Samsung R70 a stylistic, elegant look. Even the battery runtime between 1 and 4 hours is passable and makes a mobile use possible.